"I will consecrate the tent of meeting." As a parent who has experienced a child going missing – even if only for a very short while – I understand the feeling of panic that completely engulfs anyone in the same circumstance. How Kate and Gerry McCann must be feeling I cannot even begin to imagine. Thankfully I also know the amazing feeling of relief and joy when a child is found. As a child who wandered away from his mother in a strange place, Battersea Park as it happens, I also vividly remember the feeling of being lost. Equally I know the feeling of being found when the familiar voice of my Mum suddenly rang out in my ears. To some extent we are all lost – lost in the business of our everyday life – lost in the focus of the immediate objective in hand. In our weekend away in Sidmouth we had the theme of ‘Life’, quite a wide one you will agree. In the Saturday evening Eucharist we heard the parable of the lost sheep and the lost coin, and in the main Eucharist on Sunday morning we had a wonderful enactment of a modern day Good Samaritan. In this account the religious, who passed by, was a vicar, who was late for a PCC meeting. He satisfied himself that was good enough reason for leaving the young ‘Road Rage’ victim unattended. There was also a church warden on the way to a conference, where he was to receive an honour for his contribution to his local community. A fine excuse to pass by, you might be prepared to concede. Finally a man on his way to his wedding passed by and stopped, tended to and made sure the victim was OK, going well beyond his immediate needs. The Vicar and the Church Warden were, if you like, lost in their own worlds – focused on their imminent meeting and conference – lost to the needs of the roadside victim. The young man on his way to his wedding, who you might think would be similarly lost, was able to find himself and tend to the immediate need of the victim, ignoring, temporarily, his own big event. How many times can each of us be said to be lost? How many times have we ignored the needs of others for some ‘important’ reason? It is time for us to be found again – always walking in the way of Christ – always ready to see and tend to the needs of others. That is where true joy is. At Greenbelt it seemed appropriate to begin my day with Morning Prayer in the Franciscan tent. 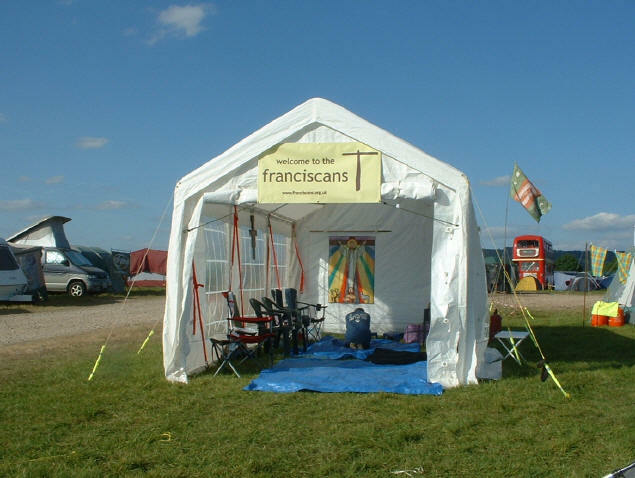 There were about twenty of us, and the format was familiar from St Mary’s and St Nicolas’, where we use a version of the Franciscan Office. It was even more meaningful to meet several hours later in the same place with some of the same people for the Evening Office. It made me appreciate how much I and each of the others had done, seen or heard during the day, and there was a real sense of relaxing in God’s presence for a few moments before continuing into our chosen evening activities. You have probably seen him – in the theatre at Stratford, or even in a TV advert – the ardent young lover clutching a red rose, gazing upwards with longing beneath the beloved’s balcony. This was the connection that came immediately to mind when I came out of the church last Tuesday morning and saw, sitting on his haunches in the churchyard, a squirrel holding in his ‘hands’ a beautiful red carnation. He was clearly nervous at my presence, so after a few seconds he placed the stem of his carnation carefully between his teeth and seeming to give a longing glance upwards to the birch tree, our Romeo began to scamper up the silver bark, pausing as they do at unexpected moments. All the time, of course, his wide-awake eye was fixed on me, but I wasn’t going anywhere. About eight feet off the ground there is a strong side branch, almost horizontal, and there he sat, still carefully clutching the flower stem. There he played at statues, as squirrels do, regarding me with a fixed stare. Of course, there was no Juliet in sight. Eventually, when he was sure of himself, he took the flower back in his hands, and held it sideways like a flute. He brought the scarlet flower up to his nose, not to smell it but eat it! With great dexterity our ludicrous young lover twirled the stem in his paws and gleefully chewed through every petal. So, if you have laid any flowers in the churchyard recently and have come back to find them scattered and broken don’t be too quick to think ill of some local vandals. It may have been Romeo. I suppose we take it for granted that since God is everywhere, unlike us mortals, he can both wave us off on our journey and be waiting to welcome us at our destination, and we think no more about it. Last month, at the end of our parish weekend in Sidmouth, Fr Michael stood in the car park at the hotel waving goodbye to us as our coach set off back to Cheltenham. It was somewhat surreal, therefore, when we pulled into the car park at St Nicolas’ some two-and-a-half hours later, to find Fr Michael standing there waiting for us! The Celebrate! service on 9th September marked the start of the 2007-8 Cotswold Churches League with a special service centred around being in a Team. 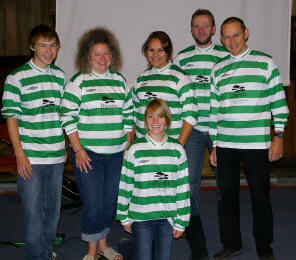 North Cheltenham Churches FC were represented in force, with team members and supporters wearing the familiar green and white hooped shirts and black training tops. 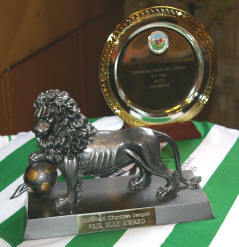 The NCC ‘trophy cabinet’ (right) was on display – the Fair Play Award for 2007 and the 9-a-Side Plate Trophy being a fine return for their first season. 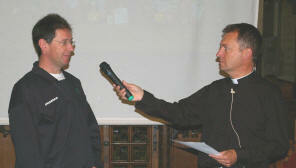 Father Michael interviewed Tim Rudge, the NCC manager, about their first season as a team and ambitions for 2007-8. Despite the loss of the team’s most fearless defender (Father Grant), there is much optimism about the coming season. Some new players have been recruited and a new Chairman, Simon Taylor of All Saints’, is now at the helm. For some of the squad this was our first time at Celebrate! and we were all made to feel very welcome. We didn’t quite get the hang of the actions to the songs but we did wave our flags with gusto. And it was good to see all the youngsters who will surely be turning out for NCC in years to come. On Saturday 8th September I cycled in a northerly direction, starting out before some churches had opened, in order to visit all those on my planned route. Where doors were closed I slipped notes under them, stating I had visited them! Beginning with St Mary’s and the United Reformed Church at Prestbury, I followed through to St Nicolas’, St Lawrence’s at Swindon Village and St Mary Magdalene’s at Elmstone Hardwicke, where I discovered that I had forgotten my sponsor/check list. Fortunately, I met the Churchwarden, Hilary Halsey, who kindly supplied me with a spare sheet! Phew! Next came St James’ at Stoke Orchard, with its traces of wall paintings, then St John’s at Tredington, where I enjoyed a cold drink and biscuit. Many churches supplied refreshments, so my blood sugar was pretty high that day. At Deerhurst I called at St Mary’s, where a carved angel could be found high up on a hidden corner of the beautiful stonework outside, some of it dating to Saxon times. I also took a look at Odda’s Chapel, which had been flooded in July, along with many other places by the River Severn. I saw signs of the flooding for many miles in dried muddy fields and lanes, with hedgerows appearing mummified in mud. Holy Trinity at Apperley was high enough to escape floods, but across Haw Bridge at Tirley, St Michael’s was closed to visitors, as was St Bart’s at Ashleworth. Both these churches had been badly damaged by flooding and stood eerily empty, with industrial driers working everywhere inside them. Next, St Mary’s at Hasfield, a lovely church with carved angels between the stone nave arches, then Hartpury, also dedicated to St Mary, but several miles away from the village. I also found the Hartpury Methodist Church, with its own well-kept graveyard. With time running tight, I pressed on to St Margaret’s at Corse, St John’s at Chaceley, which has unusual carving on its 12th century chancel arch, and St Mary’s at Forthampton, which has lovely windows. I included two churches in Worcester Diocese, and by this time was in too much haste to notice which saints they were dedicated to, namely the churches at Eldersfield and Bushley. From there it was straight on to Tewkesbury, where I visited Holy Trinity Church, the Methodist Church and Abbey St Mary. Thankfully Roger met me after these 22 visits and approximately 40 miles of cycling to take me home with my bicycle, which he maintains so well! I wish to thank all those who so kindly sponsored me, to raise £343, half of which will be given to St Mary’s, Prestbury, by the Trust. Do you enjoy new experiences, people, places? I do, but on my own terms. So when the possibilty of attending Greenbelt 07 arose I decided to go for it in just that frame of mind. What I discovered was a vast event with huge numbers of people – some 20,000 I understand. I already think our racecourse is a brilliant place and love any excuse to visit but to experience its transformation to festival site was amazing. Tents as far as the eye could see for a majority of the participants to sleep in. Portaloos, washing facilities. In addition, a number of larger tents and marquees provided shelter for event venues – talks, workshops, worship and suchlike. 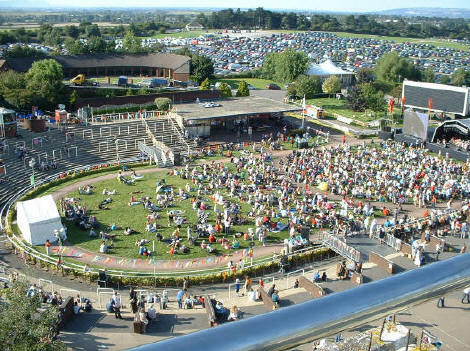 An outdoor screen on the parade ring and an outdoor stage further down the slope. And any number of small booths or tents providing retail therapy. A great variety of food was available from vans and canvas outlets. (I especially enjoyed some tempura). I also had some packed lunches I’d made at home or even popped home for food and a breather. Greenbelt is a Christian Arts Festival. There are worship sessions and talks, and music and workshops which are unashamedly centred on Jesus Christ. There are also things that aren’t, such as Shaun the Sheep films and a knitting circle. And all sorts in between like a circus themed around the culture of commercial advertising. The hardest part really was trying to work out from the schedule what to home in on because equally appealing events are bound to be on at the same time. It’s a great place to browse a big selection of Christian books or to get information on certain Christian charities or to enjoy a pint in the ‘Jesus Arms’ beer tent. Or for speed dating. Some of what I chose was a discussion about worship by members of the CofE’s Liturgical Commission, a talk by John Bell of the Iona Community whose ‘Thoughts for the Day’ I enjoy on Radio 4, a concert by the left wing singer/songwriter Billy Bragg, a talk by lawyer turned Prior Andrew Nugent who has written some thrillers, a breakdancing display by lads from Tajikistan, stand up comedy by Jo Enright, Orthodox Great Vespers…. You get the mixed picture. The experience is what you want to make of it. Perhaps you’d enjoy being a volunteer as a steward or driver or sales assistant. Or help financially by becoming a Greenbelt Angel. I’m sure the fantastic weather helped the experience, and a lack of preconceived ideas. But I’d go again (and take something squashy to sit on; grass and even carpeted floor both get very hard after a while). Is it only for one particular ‘type of Christian’ – no. Is it only for teenagers – no. Is it cheap – no. Is it good value – yes, it probably is compared to other forms of entertainment. I have been waiting to go to Greenbelt for the last two years, and at long last that time came. Simon and I had been bought a tent between us and we were looking forward to staying up late and eating hot toast and drinking hot chocolate just as everyone had told us. I really enjoyed the concerts and going to the ‘Mix’ – an activity tent for my age group. The food was really good as well with everyone mucking in and helping. The weather was fantastic and made my first Greenbelt brilliant – I can’t wait to go again!! When Dad came to collect me on the Tuesday morning I could hardly speak but he could tell I’d had an amazing experience. A big thanks to everyone who had arranged it and looked after us. A bigger Greenbelt festival than ever brought many more laughs and much more entertainment to our ever expanding youth group. As the summer hadn’t been much fun weather wise, we were lucky to be blessed with some of the best weather yet, over the bank holiday weekend, causing some sun burn for the unlucky few in our group. 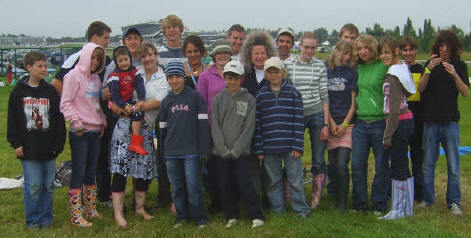 There were many highlights in this Greenbelt, including the majority of us going to see Shaun the Sheep in the arena. There were many different music acts including Billy Brag, and a collection on Monday night including Duke Special, Ian Archer and the Christian rock band called Delirious? This is where I stayed all evening, watching these bands one after each other, where Delirious? performance was inspiring. Other music included Martyn Joseph, with singer songwriters, in the The Rising, each day in the wonderful venue of the Centaur, where we often started falling asleep, as it was very comfortable and air conditioned. Comedy also featured in much of what we went to see, which was very entertaining, laughing at the good and not so good comedians on show. As a youth group, Andy Wood and myself held several worship sessions over the weekend, which bought the youth group together and allowed us to share worship in our own group daily. On Sunday 9th September this year St Mary’s church celebrated its patronal festival. For many years this was celebrated in August, at the feast of the Transfiguration, but as society became more able to take summer holidays that date was scuppered completely because it is in the middle of the school holidays and half the congregation seemed to disappear. Heritage Open Days coincides with our patronal festival and we try to do something special for this reason. Having previously delved into the ‘Oxford Movement’ and John (Edwards) de la Bere, we needed something lighter this time. We have lots of documents relating to our village and also lots of pictures so we decided to go modern and make an audio visual presentation. Ken Bradbury was eager to stretch his computer into fresh fields so we were off and away – BUT this project has involved more than twenty people and it was Summer Holiday Time and in one instance a farm to run in a year of appalling weather. The first three days of HODs week saw Ken and me frantically counting spoken sound waves, music sound waves, picture fades, sound fades etc right into Wednesday afternoon. We have a brilliant technical director in Ken and a superb coffee maker in Rosemary Bradbury, she did stop us going completely balmy and with Father Michael’s television and our DVD player we opened on time, first showing at 1pm Thursday, as advertised on the net. We were all stunned to see the interest shown, a strong and steady flow of visitors came throughout the four days, watching the film, drinking tea, studying our Victorian OS maps. Thank you, yet again, for the really professional Teas team St Nicolas’ and St Mary’s can produce. On the Saturday morning I had to attend my first Diocesan Synod, in Gloucester, where I felt very much the minnow on the edge of a lake. We started with Holy Communion and the sermon preached was one of those that strike home, hard. Its message in the most simplest of terms was that we, the body of the church, must make that body live. If we stay in the comfort of our own circle worshipping, bible studying, celebrating, then the body of Christ’s church won’t live and breathe. To fulfil God’s will, we must take our belief out into the everyday world and actually live it. This theme was recurrent throughout the morning and certainly not by design either. One item on the agenda was ‘Vocation to Teach’ presented by the leader of a project ‘Transforming Lives’. The example given was simple: a group of modern language teachers in a school looked at the GCSE syllabus; the aim is definitely: ‘as a tourist in a foreign country, can you get what you want?’ Then followed the parable of the Good Samaritan: ‘In this country, could you help a foreigner to find what he wants?’ It involves the same vocabulary, same grammar, but in each lesson they are now teaching a whole class to listen and care for their fellow men. The last section was devoted to the recent Flood Emergency. Dr Tim Brain, our chief Constable, told a riveting story and summarised it by commenting that he would never forget the unquestioning help the people of Gloucestershire gave each other and also two pictures. The first was of Tewkesbury Abbey, standing high in a sea of water and the second was the Tewkesbury scouts, slaving away throughout at the Scout Hut, supplying free drinks for all and flushing toilets! The final contribution came from the Vicar of Tewkesbury, Paul Williams, who described the closeness of their teamwork with the mayor and civic authorities. Since the Abbey was not in immediate danger, he and his wife, Catherine, also an ordained priest, and their curate, Charles Witney, decided that they would look after the High Street first. They spent all their free time filling sand bags as the water crept up. When it was time for evening prayer they returned, alone, to the Abbey only to find that water rising from the drains was getting in at the south door. They started sand bagging again but it was hopeless so Father Paul dashed to the Bell Inn over the road. He remarked that he had never emptied a pub so quickly in his life. The whole crowd within raced back with him and joined the battle. When they had won he said that now he must go and say evening prayer. The pub crew replied that though they were not into his sort of thing, they would stay with him, the Abbey had supported the town so now they would support the Abbey. Every one of them stayed to listen to Evening prayer. Father Paul sat down quickly with a very tight throat. I lunched on tea and cake and joined the team of stewards again. We met so many strangers as well as friends. Father Peter must have near drowned in cups of tea by Sunday evening, acting as a host on the map and tea side of the church whilst a rota of us ushered people to seats, gave out programmes and took orders for DVDs. What was planned very much for our own interest turned into quite a party for four afternoons, talking, meeting old friends, making new. It brought the meaning of the Saturday morning sermon back to me – go out, meet people in everyday life and Christ is alive with us. We didn’t set out to do it, it just happened. For four whole days, St Mary’s was very alive, in the nicest possible way. Everybody watched and listened to John de la Bere III’s final words on the DVD which echoed so closely Father Michael’s sermon of that Sunday morning, and on several occasions our audience burst into a round of spontaneous applause. I am afraid you will have to listen to what John de la Bere said to understand why. It is beyond me to explain. What does a man gain from all his labour at which he toils under the sun? Generations come and generations go… The sun rises and the sun sets… The wind blows to the south and turns to the north; round and round it goes… All things are wearisome, more than one can say… What has been done will be done again; there is nothing new under the sun… I have seen all the things that are done under the sun; all of them are meaningless, a chasing after the wind. Ecclesiastes is one of my favourite books in the Bible. Nestling somewhere between Psalms and Isaiah it is short enough to be read at one sitting. It follows a style of ‘pessimism literature’ going back to 2000 BC in both Mesopotamia and Egypt. It is the only example included in the Bible and differs from other writings, where pessimism is unrelieved, in that it offers the possibility of joy, faith and assurance of God’s goodness. We do not know who this Teacher is. Chapter 1 verses 1, 12 and 16 point to his possibly being King Solomon, but that name is not mentioned. Whoever he is, by Chapter 2 he seems to have had a go at everything: pleasure (v2), wine (v3), great gardening projects (v5), amassing wealth (v8) and yet here we go again in verse 11: ‘When I surveyed all that my hands had done, everything was meaningless.’. He realises that, wise or foolish, all of us die in the end, and he comes to hate life, feeling that all that he has achieved will be passed on to someone else who has not worked for it, so what’s the point in bothering? Then comes the first hint of light: we might as well get on with eating, drinking and finding satisfaction in our work because it ‘is from the hand of God, for without him who can eat or find enjoyment?’ (v 24-25). It is with this recognition of God that this book differs from more traditional pessimism literature. In Chapter 3 we read that wonderful passage: ‘There is a time for everything… to be born and to die… to weep and to laugh… to be silent and to speak…’. Is this just fatalism or is it an acknowledgement that God is there, holding our every situation in his hand? In later chapters the Teacher discusses poverty and riches, politics and religion, wisdom and folly, wine, women and light entertainment, gossip, friendship and old age. Although he appears to conclude in 12:8 that everything is still meaningless, a more positive thread has crept in, almost as a refrain, suggesting that our satisfaction and pleasure derive not from the things themselves, but from our relationship with the God whose gift they are (3:12-13, 22; 5:18-20; 8:15; 9:7). So if, in the midst of our misery, we can thank God for what he provides, however meaningless it may seem at the moment, then we can begin to piece things together again and come to enjoy life once more in a fuller relationship with him. From Monday 1st October Evening Prayer at St Nicolas’ on weekdays (Monday to Saturday, excluding bank holidays) will be at 5pm, half an hour later than at present. Do join us whenever you can for this short reflective service. The next ‘Eucharist with a Difference’ at St Nicolas’ will be on Sunday 7th October at the usual time of 9.30am. Do come and join us for this special time of worship. We continue with the last two chapters of Jonah on the 9th and 23rd October in All Saints’ church. Coffee is available from 6.45pm and the bible study runs from 7-8pm. All are welcome. Compline will be said at approximately 8pm by those who wish to stay on. Malcolm McKelvey was Director of Music in Prestbury parish from 1989 to 2003 and this series of concerts in his memory is to raise money for work on St Mary’s organ. On Saturday 13th October at 7.30pm in St Mary’s church the St Cecilia Singers will give a concert of English music. Admission is by ticket, on sale in advance and at the door, and will include refreshments. Please see leaflets or pewsheets for details. The final concert in the series will be on Wednesday 7th November at 11am and will feature Peter Greaves, the current organist at St Mary’s. On Sunday 14th October there will be a Taizé Singing Workshop at St Nicolas’ church from 3.30-5pm led by the Revd Maz Allen from the United Reformed Church. This will be followed by a bring-and-share tea, and the afternoon will conclude with Taizé service at 6.30pm in St Nicolas’. This is a Churches Together in North Cheltenham event and is an opportunity to meet together with members of the various churches in North Cheltenham, as well as St Michael’s (Whaddon), Prestbury URC and Holy Name Hall. The next bakestall at St Mary’s is on Sunday 21st October with contributions from those with surnames A-F. Please contact one of us if you would like to join the rota. Our meeting this month is on Tuesday 23rd October at 7.30pm at St Nicolas’ and will feature a talk by Father Paul Iles. You are very welcome to join us even if you are not a member of the MU. Thank you to all who offered welcome and hospitality at St Mary’s during the patronal weekend. Also to those involved in the production of the Travels Through Time DVD. Copies of the DVD are available at £7 by using one of the request forms in St Mary’s or from Lynda Hodges. All profits to the Quinquennial Appeal Fund.